Q1. What is the FATCA Registration System? An overview of the FATCA Registration System is available, along with other Registration Resources and Support Information, on the FATCA Registration Resources Page. Q2. What training is available for the Registration System? In addition to these Q&As, the FATCA Registration Online User Guide will provide information on how to answer questions and navigate through the online system. Short “how-to” videos for the Registration system are also available on the FATCA Registration Resources Page.The IRS anticipates adding more items in the near future to aid those registering through the FATCA Registration Website. Q3. What help will be available for the FATCA Registration System? The FATCA Registration Resources Pagecontains information to get you started, including the FATCA Registration Online User Guide, short “how-to” videos for the Registration system, and other resources.If help is needed prior to logging onto the FATCA registration system, the Registration User Guide will provide information about logging in and navigating through the system. There is also a link “Forgot FATCA ID or Access Code?” on the login page with information on how to obtain assistance with login issues.Once logged on, the FATCA registration system contains help icons (question marks) throughout the registration with information on particular questions or fields. At the top of each page of the FATCA registration system there is a navigation bar with a “get help” option that will provide additional resources and contact information. Q4. What languages will the registration system be available in? The registration system will be in English only; however only certain special characters will be accepted (~ ! @ # % ^ * ( ) ? , . ). Q5. Will there be a test environment or a beta version of the FATCA registration system? No, there will not be a test environment or a beta version of the registration system. The registration system is currently open. The FI’s can input their data. On or after January 1, 2014, the FI will need to submit their registration. Q6. Will the system have certain mandatory fields or will they all be mandatory? Not all fields in the online registration form are mandatory. Fields that are mandatory are marked with an asterisk at the end of the question. Also, depending on how you answer a question, the system will automatically skip some questions as appropriate. Q7. Will there be an automatic check of legal names against a database to prevent misspellings or to provide consistent formatting? The system will validate that the legal name contains only valid characters, but will not check the legal name against any database for spelling or format issues. Valid characters include lower and upper case letters (a-z, A-Z), numbers (0-9), and the following special characters: blank space, ampersand (&), hyphen (-), forward slash (/), period (. ), comma (,), apostrophe (‘), pound sign (#), and percent sign (%). The legal name cannot start with a special character. Q8. What is the maximum number of characters allowed for name fields? Most name fields allow for up to 40 characters to be input. You will not be able to input more characters than allowed in a particular field. There are specific error messages to guide you when you click on the “Next” or “Save” button in the registration system if there is a problem with the input you provided. At least the first 10 characters must match the FI’s legal name. Any legal and numerical designations must be included in the remaining 30 characters. No abbreviations in the first 10 characters, but otherwise it is okay to abbreviate. Q10. How can a Financial Institution register an entity in a newly created country? The FATCA registration system includes countries on the ISO 3166 listing, and as new countries are added, the system will be updated to include them. There is also an option to select “other” for the country if the system has not yet added a country to the drop down lists. Q11. Does the system have the capability to show the questions and responses before the registration is submitted? Can the questions and responses be printed or saved? The registration is separated into four parts. In the online registration system, how each part displays depends upon how the questions are answered; accordingly, the Financial Institution (FI) will only see the parts of the form that are applicable to it. At the end of parts 1 through 3, there is an edit / review function which will display the questions and responses provided. The FI can use the print functionality from its browser to print each of these parts. Once the registration is submitted, there are options on the home page to review each of the applicable parts of the registration. There is also an option for the FI to print, view, and save (in pdf format) the agreement (part 4) of the form.An FI (except Sponsoring Entities) can view or save (in pdf format) its branch table information from the home page.A Lead FI can view or save (in pdf format) its member FI table from the home page. An FI can edit its registration by selecting the “Registration-Edit/Complete/Submit” option on its home page. Q12. What is the maximum number of users that can access a FATCA account at one time? Each Financial Institution (FI) will have its own FATCA Account, with a unique FATCA ID. Although the login credentials (FATCA ID and access code) can be shared between the Responsible Officer and up to five (5) points of contact designated on the registration form, only one person can access the account at a time.For Expanded Affiliated Groups, each member FI has its own FATCA ID and access code, so members can log into the system independent of other members of the group. The Lead FI has access to all of the member FI accounts from their home page, and if the Lead FI is accessing a member account, that member will not be able to log in. If a member FI is logged in, the Lead FI will not be able to access that member account until the member logs out; however it will be able to access its own lead account. Q13. What are the password requirements for FATCA Accounts? When creating a FATCA account, a Single, Lead or Sponsoring Entity Type Financial Institution will create an access code (like a password) to be used with the systemically assigned FATCA ID for all future logins to the account. The access code must be between 8 and 20 characters and include at least one uppercase letter, one lowercase letter, one number, and one of the following special characters ~ ! @ # % ^ * ( ) ? , .For Member type FI’s, the registration system will generate a unique FATCA ID and a temporary access code for each member when the Lead FI creates the member accounts. The Lead FI will provide the login information to each of its member FIs. When each member FI logs into their FATCA account, they will be prompted to select a new access code, following the criteria described in the above paragraph. Q14. What are challenge questions used for? Each Financial Institution (FI) will select two challenge questions from a list of predefined questions and provide an answer to each. For all FIs except Member Type FIs, this will be done as part of the account creation process. Lead FIs will create all member FI accounts, and the first time the Member FI logs into their FATCA account, they will be prompted to select and answer their challenge questions. Each FATCA account will have two challenge questions and answers provided by the FI.Challenge questions will be used by each FI to reset their own access code if they forget it. Challenge questions and answers can be reviewed and updated at any time by the FI when logged into their account. From the home page, the FI can select the “Challenge Questions – Edit/Review” option and review and make changes as necessary. Q15. Can a member of an Expanded Affiliated Group (EAG) create their own FATCA account? A Member Financial Institution (FI) cannot create its own FATCA account. The Lead FI will create all their member accounts and provide each member FI with its login credentials. The member will then log into its account and complete its registration. Q16. What is the time lapse between the creation of the FATCA ID for the Lead FFI and the FATCA IDs for the Member FFIs? Once the Lead FI creates its own FATCA account, and has completed Part 1 of the registration, it will create the FATCA accounts for each member by adding the members in Part 2, question 12 of the online registration. As soon as a member’s information is completed, and the “add another” button is clicked, that member FI will appear in the table below the question with its FATCA ID and temporary access code. Q17. What type of notifications will the FATCA Registration system provide? The FATCA Registration system will generate automatic e-mail notifications to the Responsible Officer (RO) to check the FATCA account when a financial institution (FI) registration changes between some statuses. There will also be messages posted on the FI’s message board, which it can access on the home page of its FATCA account. Q18. How can a Financial Institution check the status of its registration? A Financial Institution (FI) can check the status of its FATCA registration by logging into its FATCA account and checking the account status displayed on its home page. The system will also generate automatic e-mail notifications to the Responsible Officer (RO) to check the FATCA account when a Financial Institution (FI) registration changes between some statuses. A list of statuses and their definitions can be found in the appendix of the FATCA Registration Online User Guide. Q19. Can the Responsible Officer (RO) list more than one e-mail address on the registration system? The RO can only list one e-mail address in question 10 of the registration. Q20. Can the change of status e-mail notifications go to the Responsible Officer (RO) and the Points of Contact (POCs)? The registration system will send an e-mail only to the Responsible Officer when the registration changes between some statuses. Therefore, the FI should carefully consider which email address is provided in question 10 of the registration. Q21. If a lead Foreign Financial Institution (FFI) of an Expanded Affiliated Group (EAG) registers and lists each Member on Part 2 of the registration, then would each member of the EAG still need to separately register? Each member financial institution of the EAG will need to complete a registration, once the Lead has created its account. In part 2 of the Lead FI’s registration, the lead FI will add basic identifying information for each member, and the system will create the member FATCA accounts. Each member will then need to log into the system and complete its registration. Q22. Once the lead Financial Institution (FI) has its FATCA ID, will it be possible for each of the member Expanded Affiliated Group (EAG) entities to log on at the same time to register? Once the Lead adds a member under part 2 of the Lead’s registration, the system will generate a FATCA ID and temporary access code for the member (thus establishing the member’s account). The Lead will give that account information to the member and it can log into its member account. Each FI has its own account, so the Lead and member(s) can all be logged in at the same time to their own accounts. Because the Lead FI has access to member accounts, only one (either the Lead or Member FI) can access the member account at a time. Q23. How does the lead Financial Institution (FI) access its member FI accounts? Once a lead FI creates its member accounts, it can access the member FI accounts by clicking on the “view member information link” from its homepage, and clicking on the name of the member FI in the table. The Lead FI can access each of its member accounts under its own lead FI account login – it does not need to log into each of the member accounts separately. However, since only one person can access the account at a time, the lead FI will get an error message if it tries to access the member account when the member FI is logged in, and the member FI will not be able to log into its account if the lead FI is accessing it. Q24. Where does a Financial Institution (FI) send information to have updates made on its registration? Updates cannot be made on paper. Once an account is established, (whether on the paper form 8957 or online), the FI will manage any updates to its registration form and account online. An FI that chooses to initially register on paper will have its logon information sent to it in the mail. The FI will log into the FATCA Registration System, and select the” Registration – Edit/Complete/Submit” option from its home page to edit the registration form data, or choose from other available account options. Q25. How can the access code for the FATCA account be changed? The financial institution (FI) can change the access code by logging into the FATCA account, and selecting the “Access Code – Change” option from its home page.The FI can also reset its own access code if it forgets it by clicking on the “Forgot FATCA ID or Access Code?” link from the login page, and following the instructions to answer the challenge questions provided during registration.Member financial institutions will also be required to change their initial temporary access code provided by their Lead FI the first time they log into the system. Q26. How can the Responsible Officer (RO) or Points of Contact (POCs) be changed? An FI can edit its registration by logging into its FATCA account and selecting the “Registration – Edit/Complete/Submit” option from its home page. To change the RO or POCs, the FI would edit Question 10 or 11 of the registration as appropriate, and resubmit the registration.Because the RO and POCs share the login credentials for the FATCA Account, the FI may want to change its access code when its personnel changes. The access code can be changed from the home page by selecting the “Access Code – Change” option. Q27. Can a Financial Institution (FI) that is limited change to a Participating FFI? Yes, an FI can edit their registration by logging into its FATCA account and selecting the “Registration – Edit/Complete/Submit” option from its home page. The FI would change its classification in question 4, and resubmit its registration. Q28. How do I get my registration out of registration submitted status? Notice 2013-43 stated that after January 1, 2014 the FI will need to submit a final registration. If an FI submitted a registration prior to this date, it can be changed by the FI. To change the status of your registration from registration submitted, go to your home page. Under Available Account Options: Select “Registration – Edit/complete/Submit.” You will be asked if you want to change your status to “initiated.” Select yes. After January 1, 2014, you may submit your registration as final. Q29. Why did my registration status change toRegistration Incomplete and how do I submit the registration again? Notice 2013-43 stated that after January 1, 2014 the FI will need to submit a final registration. If an FI submitted a registration prior to this date, the registration status will be systemically updated to Registration Incomplete on December 31, 2013. The registration system will be unavailable during this time.Beginning on January 1, 2014, you can login to your FATCA account, and resubmit your registration by selecting “Registration – Edit/Complete/Submit” under the Available Account Options on your home page. You will be asked if you want to change your status to Initiated. Select yes, and review each page of the registration, making any necessary updates, and clicking the “next” button at the bottom of each page to continue. When you get to Part 4 of the registration, complete the information, and click on the Submit button. Your registration status will then be updated toRegistration Submitted. You can go back at any time to update information. Q30. What is a GIIN? A GIIN Composition Document is available along with other Registration Resources and Support Information, on the FATCA Registration Resources Page. Q31. Will Financial Institutions (FIs) and Branches that are limited be issued GIINs? No, FIs and branches that are limited will not be issued GIINs. Q32. What is the format of the GIIN? The GIIN is a 19-character identification string that is a composite of different identifiers, including the FATCA ID, Financial Institution type, category code and country identifier. For more information see the full description in the GIIN Composition Document. Q33. Are the period (.) separators in the GIIN required? Yes. The period separators comprise three characters in the 19-character identification number. Please see the GIIN Composition Document for more information. The 34 chapters include many practical examples to assist a compliance officer contextualize the regulations, IGA provisions, and national rules enacted pursuant to an IGA. The chapters include in-depth analysis of such topics as the categorization of trusts pursuant to the Regulations and IGAs, operational specificity of the mechanisms of information capture, management and exchange by firms and between countries, insights as to the application of FATCA and the IGAs within new BRIC and European country chapters. The IRS has finally given high-income taxpayers a break with the release of the final regulations governing the new 3.8% tax on net investment income. These final rules mark a dramatic shift from the IRS’s previous position. By adding flexibility to the rules, the IRS’s unanticipated amendments ease the sting of the investment income tax. 1. Start a filing system. If you don’t have a filing system for your tax records, you should start one. It can be as simple as saving receipts in a shoebox, or more complex like creating folders or spreadsheets. It’s always a good idea to save tax-related receipts and records. Keeping good records now will save time and help you file a complete and accurate tax return next year. 3. Contribute to Retirement Accounts. You need to contribute to your 401(k) or similar retirement plan by Dec. 31 to count for 2013. On the other hand, you have until April 15, 2014, to set up a new IRA or add money to an existing IRA and still have it count for 2013. As we inch closer to 2014, many clients are gearing up for a potential reduction in covered health benefits as employer-sponsored health plans are modified and insurers have begun cancelling coverage in anticipation of the Affordable Care Act (ACA) effective date. Planning for these costs is heating up, and the IRS has placed the significance of the health flexible spending account (FSA) as a tax-free funding tool in the spotlight. While reducing taxable income in light of higher tax rates is a priority for many clients, the potential for increased out-of-pocket medical expenses under the ACA may provide an even stronger motivation in 2014. As a result, the double tax benefits offered by FSAs have become more valuable than ever, and the IRS has recently taken steps to ease the restrictions that may have previously dissuaded clients from taking advantage of these vehicles. In the gift tax arena, the value assigned to the transferred property can often make or break your high-net-worth clients’ tax planning strategies, leading many clients to move conservatively through the valuation minefield. Despite this, the newest strategy to emerge in the world of gift tax valuation can actually allow these wealthy clients to reduce their estate tax liability. Reversing course from a previous line of cases, the Tax Court recently blessed a cutting edge valuation strategy for lifetime gifts that can be used to reduce overall estate tax liability for these clients by simultaneously reducing the bite of the often-overlooked three-year bringback rule—a rule which can cause even the most carefully laid estate plans to fail. The Affordable Care Act (ACA) mandate that will require employers with more than 50 full-time employees to provide health coverage for those employees or pay a penalty that can reach $3,000 per employee has many small business clients scrambling to plan for years ahead. Because independent contractors are not counted toward the 50-employee limit, some small business clients may be tempted to reclassify common law employees as independent contractors to avoid the mandate. Over 400 pages of compliance analysis !! now available with the 20% discount code link in this flier –> LN Guide to FATCA_flier. Kyria Ali, FCCA is a member of the Association of Chartered Certified Accountants (“ACCA”) of Baker Tilly (BVI) Limited. Michael Alliston, Esq. is a solicitor in the London office of Herbert Smith Freehills LLP. Ariene d’Arc Diniz e Amaral, Adv. is a Brazilian tax attorney of Rolim, Viotti & Leite Campos Advogados. Maarten de Bruin, Esq. is a partner of Stibbe Simont. Jean-Paul van den Berg, Esq. is a tax partner of Stibbe Simont. Amanda Castellano, Esq. spent three years as an auditor with the Internal Revenue Service. Luzius Cavelti, Esq. is an associate at Tappolet & Partner in Zurich. Bruno Da Silva, LL.M. works at Loyens & Loeff, European Direct Tax Law team and is a tax treaty adviser for the Macau special administrative region of the People’s Republic of China. Prof. J. Richard Duke, Esq. is an attorney admitted in Alabama and Florida specializing over forty years in income and estate tax planning and compliance, as well as asset protection, for high net wealth families. He served as Counsel to the Ludwig von Mises Institute for Austrian Economics 1983-1989. Dr. Jan Dyckmans, Esq. is a German attorney at Flick Gocke Schaumburg in Frankfurt am Main. Arne Hansen is a legal trainee of the Hanseatisches Oberlandesgericht (Higher Regional Court of Hamburg), Germany. Mark Heroux, J.D. is a Principal in the Tax Services Group at Baker Tilly who began his career in 1986 with the IRS Office of Chief Counsel. Rob. H. Holt, Esq. is a practicing attorney of thirty years licensed in New York and Texas representing real estate investment companies. Richard Kando, CPA (New York) is a Director at Navigant Consulting and served as a Special Agent with the IRS Criminal Investigation Division where he received the U.S. Department of Justice – Tax Division Assistant Attorney General’s Special Contribution Award. Denis Kleinfeld, Esq., CPA. is a renown tax author over four decades specializing in international tax planning of high net wealth families. He is Of Counsel to Fuerst Ittleman David & Joseph, PL, in Miami, Florida and was employed as an attorney with the Internal Revenue Service in the Estate and Gift Tax Division. Richard L. Knickerbocker, Esq. is the senior partner in the Los Angeles office of the Knickerbocker Law Group and the former City Attorney of the City of Santa Monica. Saloi Abou-Jaoude’ Knickerbocker Saloi Abou-Jaoude’ Knickerbocker is a Legal Administrator in the Los Angeles office of the Knickerbocker Law Group concentrated on shari’a finance. Jeffrey Locke, Esq. is Director at Navigant Consulting. Josh Lom works at Herbert Smith Freehills LLP. Prof. Stephen Polak is a Tax Professor at Thomas Jefferson School of Law’s International Tax & Financial Services Graduate Program where he lectures on Financial Products, Tax Procedure and Financial Crimes. As a U.S. Senior Internal Revenue Agent, Financial Products and Transaction Examiner he examined exotic financial products of large multi-national corporations. Currently, Prof. Polak is assigned to U.S. Internal Revenue Service’s three year National Research Program’s as a Federal State and Local Government Specialist where he examines states, cities, municipalities, and other governmental entities. Dr. Maji C. Rhee is a professor of Waseda University located in Tokyo. Jean Richard, Esq. a Canadian attorney, previously worked for the Quebec Tax Department, as a Senior Tax Manager with a large international accounting firm and as a Tax & Estate consultant for a pre-eminent Canadian insurance company. He is currently the Vice President and Sr. Wealth Management Consultant of the BMO Financial Group. Michael J. Rinaldi, II, CPA. is a renown international tax accountant and author, responsible for the largest independent audit firm in Washington, D.C.
Edgardo Santiago-Torres, Esq., CPA, is also a Certified Public Accountant and a Chartered Global Management Accountant, pursuant to the AICPA and CIMA rules and regulations, admitted by the Puerto Rico Board of Accountancy to practice Public Accounting in Puerto Rico, and an attorney. Hope M. Shoulders, Esq. is a licensed attorney in the State of New Jersey whom has previously worked for General Motors, National Transportation Safety Board and the Department of Commerce. Jason Simpson, CAMS is the Director of the Miami office for Global Atlantic Partners, overseeing all operations in Florida, the Caribbean and most of Latin America. He has worked previously as a bank compliance employee at various large and mid-sized financial institutions over the past ten years. He has been a key component in the removal of Cease and Desist Orders as well as other written regulatory agreements within a number of Domestic and International Banks, and designed complete AML units for domestic as well as international banks with over three million clients. Dr. Alberto Gil Soriano, Esq. worked at the European Commission’s Anti-Fraud Office in Brussels, and most recently at the Legal Department of the International Monetary Fund’s Financial Integrity Group in Washington, D.C. He currently works at the Fiscal Department of Uría Menéndez Abogados, S.L.P in Barcelona (Spain). Lily L. Tse, CPA. is a partner of Rinaldi & Associates (Washington, D.C.). Dr. Oliver Untersander, Esq. is partner at Tappolet & Partner in Zurich. Mauricio Cano del Valle, Esq. is a Mexican attorney who previously worked for the Mexican Ministry of Finance (Secretaría de Hacienda) and Deloitte and Touche Mexico. He was Managing Director of the Amicorp Group Mexico City and San Diego offices, and now has his own law firm. John Walker, Esq. is an accomplished attorney with a software engineering and architecture background. Bruce Zagaris, Esq. is a partner at the Washington, D.C. law firm Berliner, Corcoran & Rowe, LLP. Prof. William Byrnes was a Senior Manager then Associate Director at Coopers & Lybrand, before joining academia wherein he became a renowned author of 38 book and compendium volumes, 93 book & treatise chapters and supplements, and 800+ articles. He is Associate Dean of Thomas Jefferson School of Law’s International Taxation & Financial Services Program. Dr. Robert J. Munro is the author of 35 published books is a Senior Research Fellow and Director of Research for North America of CIDOEC at Jesus College, Cambridge University, and head of the anti money laundering studies of Thomas Jefferson School of Law’s International Taxation & Financial Services Program. 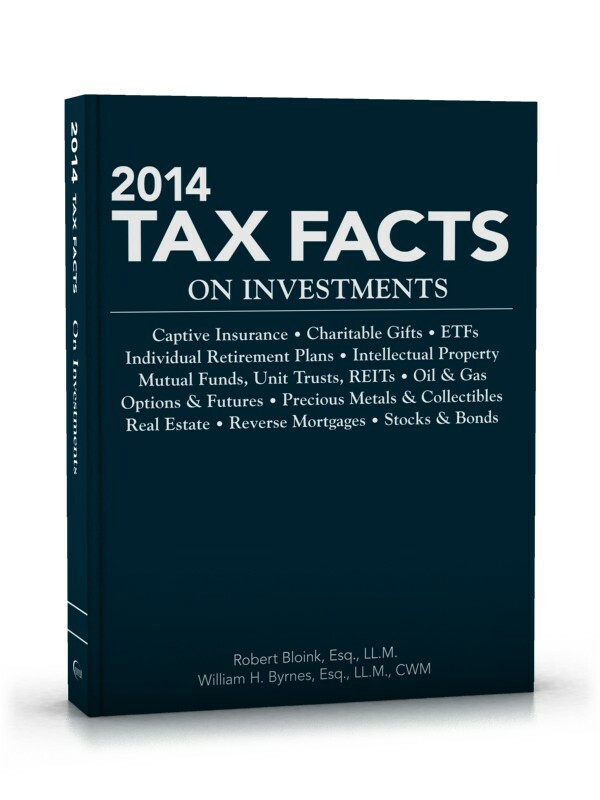 National Underwriters published 2014 editions of Tax Facts books authored by William Byrnes and Robert Bloink of the graduate tax program. Both publications are now available as e-books, as an alternative or in combination with print. From the turn of the twentieth century, Congress and the states have uniformly granted tax exemption to charitable foundations, and shortly thereafter tax deductions for charitable donations. But an examination of state and federal debates and corresponding government reports, from the War of Independence to the 1969 private foundation reforms, clearly shows that politically, America has been a house divided on the issue of the charitable foundation tax exemption. By example, in 1863, the Treasury Department issued a ruling that exempted charitable institutions from the federal income tax but the following year, Congress rejected charitable tax exemption legislation. However thirty years later, precisely as feared by its 1864 critics, the 1894 charitable tax exemption’s enactment carried on its coat tails a host of non-charitable associations, such as mutual savings banks, mutual insurance associations, and building and loan associations. Yet, the political debate regarding tax exemption for the non-charitable associations did not nearly rise to the level expended upon that for philanthropic, private foundations established by industrialists for charitable purposes in the early part of the century. But the twentieth century debate upon the foundation’s charitable exemption little changed from that posited between the 1850s and 1870s by Presidents James Madison and Ulysses Grant, political commentator James Parton and Dr. Charles Eliot, President of Harvard. The private foundation tax exemption evoked a populist fury, leading to numerous, contentious, investigatory foundation reports from that of 1916 Commission of Industrial Relations, 1954 Reece Committee, 1960 Patman reports, and eventually the testimony and committee reports for the 1969 tax reform. These reports uniformly alleged widespread abuse of, and by, private foundations, including tax avoidance, and economic and public policy control of the nation. The private foundation sector sought refuge in the 1952 Cox Committee, 1965 Treasury Report, and 1970 Petersen Commission, which uncovered insignificant abuse, concluded strong public benefit, though recommending modest regulation. During the charitable exemption debates from 1915 to 1969, Congress initiated and intermittently increased the charitable income tax deduction while scaling back the extent of exemption for both private and public foundations to the nineteenth century norms. At first, the private foundation’s lack of differentiation from general public charities protected their insubstantially regulated exemption. But in 1943, contemplating eliminating the charitable exemption, Congress rather drove a wedge between private and public charities. This wedge allowed the private foundation’s critics to enact a variety of discriminatory rules, such as limiting its charitable deduction from that of public charities, and eventually snowballed to become a significant portion of the 1969 tax reform’s 585 pages. This article studies this American political debate on the charitable tax exemption from 1864 to 1969, in particular, the debate regarding philanthropic, private foundations. The article’s premise is that the debate’s core has little evolved since that between the 1850s and 1870s. To create perspective, a short brief of the modern economic significance of the foundation sector follows. Thereafter, the article begins with a review of the pre- and post-colonial attitudes toward charitable institutions leading up to the 1800s debates, illustrating the incongruity of American policy regarding whether and to what extent to grant charities tax exemption. The 1800s state debates are referenced and correlated to parts of the 1900s federal debate to show the similarity if not sameness of the arguments against and justifications for exemption. The twentieth century legislative examination primarily focuses upon the regulatory evolution for foundations. Finally, the article concludes with a brief discussion of the 1969 tax reform’s changes to the foundation rules and the significant twentieth century legislation regulating both public and private foundations. Why is this Topic Important to Financial Professionals? Look in most local business journals that report on the formation of new business entities and you will see 95% of new businesses are formed as an “L.L.C.” This company structure is the primary one for entrepreneurs, professionals, and small businesses. However, after twenty years of significant usage, many questions about this form of entity are still novel. The financial professional should be able to explain to a client the basics of the Limited Liability Company. Limited Liability Companies (commonly called “LLCs”) are state statute sanctioned legal business entities. The business entity is similar to a limited liability partnership except that it has members and not partners (no need for general partners). Moreover, some states allow for only one member, known as a single-member LLC, an option not available in partnership entities that require at least two partners. The members can be persons but may be other business entities, such that an LLC can be a member of another LLC. The LLC can be established and managed so as to offer the benefits of a corporation such as limited liability and continuation after a member’s death, but without the impact of corporate taxation. What is the benefit of an LLC? The LLC properly managed provides for the protection of personal financially liability in connection with the business liability. Proper management generally includes following the annual requirements of corporation law, such as holding an annual directors and members meeting, and recording corporate minute (this will be discussed in future blogticles). Additionally, the LLC avoids double taxation because of it can elect to be a “pass-through” entity for federal and state tax purposes – like a partnership or a sole-proprietorship is treated. Also, most LLCs do not have a restriction on the number of members as S-Corps have (albeit rarely will the number of members or shareholders be an issue for a financial professional’s client). To learn more details and nuances of each business structure see the AUS Main Section 10. Basics Of Business Insurance, A—Forms Of Business Organization. More detail on LLCs specifically is provided in AUS Main Section 14.1, I—The Limited Liability Company (LLC). What are some limitations of the LLC? Aside from the fact that LLCs have essentially developed as a hybrid of older forms of business organizations, and are relatively new in the history of corporation law. The LLC is not a corporation in the traditional sense of the word. Sometimes businesses start as an LLC but expand to a point of eventually considering receiving outside equity with the goal of a public offering such as listing on a stock exchange. The LLC is not suitable for “going public”. Thus at the stage of soliciting equity investment for a business a client may have outgrown the LLC and should convert into a C-Corporation (a topic that will be addressed in a future blogticle). The Federal Government allows the business owner(s) of the LLC to choose how the LLC will be characterized for tax purposes. The LLC may be taxed as a Corporation (both Subchapter C and S), partnership or sole-proprietorship. This process is generally referred to as “Check the Box”. The IRS Check the Box Form is Number 8832 and the business owners literally check one of the included boxes on that form and then file the corresponding tax returns. What are some other uses of LLCs? LLCs are used in many transactions by high-net worth client. Sometimes clients use an LLC in place of a trust in the irrevocable life insurance trust (commonly called an “ILIT”) structure. By example, in a situation where a client wants less restriction on the direction of the assets of the vehicle, the LLC is a more popular choice than the ILIT. As a result, the LLC has become a common tool for the financial planner. A detailed discussion of one of these transactions is examined in the AUS Main Section 14.1, I-The Limited Liability Company (LLC). “LLC as an Alternative to a Life Insurance Trust”. Tomorrow’s blogticle will address Accounting for Corporations and Limited Liability Companies and How it Relates to Insurance. Internal Revenue Service Form 8832, http://www.irs.gov/pub/irs-pdf/f8832.pdf. The U.S. Court of Appeals for the Ninth Circuit recently affirmed the Tax Court’s position on the use of surrender charges in the valuation equation when a nonqualified employee benefit plan that holds a life insurance policy distributes that policy to a taxpayer upon winding up of the plan. When these life insurance policies are distributed to the taxpayer-employees under such a plan, the taxpayers are responsible for paying taxes on the value of the policies. According to the IRS, the policy value equals the cash value of the policy without regard to any surrender charges. So what do your clients have to include in income if the actual cash surrender value of their life insurance policy is negative? by Professor Denis Kleinfeld, Esq. 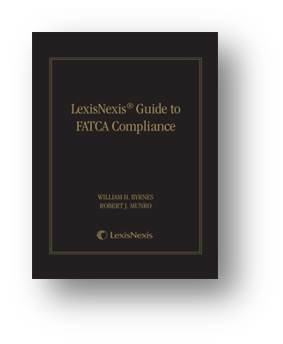 (Contributing Expert Author, LexisNexis® Guide to FATCA Compliance. Author of Langer on Practical International Tax Planning. Attorney, Miami, Florida). The U.S. Treasury announced on July 12, that due to overwhelming concern from countries around the world, the implementation of FATCA (the Foreign Account Compliance Tax Act) would be deferred from January 1, 2014 to June 30, 2014. Note: The following is an excerpt from Chapter 11 of the LexisNexis® Guide to FATCA Compliance* – The title is now shipping to customers world-wide. In cross-border transactions, the U.S. tax system, as well as the tax systems of most other nations or jurisdictions, contains rules to determine and identify items of income (or expense) derived from U.S. sources or foreign sources-referred to from the U.S, perspective as U.S. source income or foreign source income. This is generally referred to as the source of income rules. The U.S. Internal Revenue Code (IRC) contains source of income rules.1 Tax treaties also provide and often clarify source of income rules. The source of income rules provide the basis for taxation, but the operating rules are contained elsewhere in the IRC. The income category generally determines the source of income rules. These rules attempt to assign income to a U.S. or non-U.S. source on a statutory basis by looking at the perception of what is the predominate situs (location) of the economic activity that generates the income, and the source of legal protections that facilitate such income generation. Certain categories of U.S. source income are subject to withholding “at source”-i.e. in the U.S. Because the U.S. has no taxing authority or jurisdiction over foreign persons, the IRC finds one or more withholding agents who are required to withhold at source in the U.S. Generally when transfers of these certain categories of income are made to persons outside the U.S., the withholding agent in the U.S. withholds a certain percentage of the funds and remits the funds to the Internal Revenue Service (IRS). The withholding rules are generally described under the Qualified Intermediary (QI) program. The U.S. added the Foreign Account Tax Compliance Act (FATCA) as an additional layer over QI.2 FATCA consists of worldwide reporting and withholding rules designed to greatly reduce U.S. tax noncompliance for accounts and certain assets held offshore by U.S. taxpayers. FATCA’s withholding rules are discussed in this chapter. 1 Primarily IRC §§ 861, 862, 863, 865. In a major U.S. Treasury announcement about FATCA this morning (July 12, 2013) titled “Engaging with More than 80 Countries to Combat Offshore Tax Evasion and Improve Global Tax Compliance”, Treasury extended by 6 months the start of the Foreign Account Tax Compliance Act (FATCA) withholding and account due diligence requirements. Treasury stated that “due to overwhelming interest from countries around the world, a six-month extension to will be provided to allow more time to complete agreements with foreign jurisdictions.” Boiled down, Treasury has granted a 6 month extension, to July 1, 2014, for foreign financial institutions to achieve FATCA compliance because just three days before the FATCA Registration Portal should have opened, only 7 IGA have been agreed and signed by the United States and foreign countries. Moreover, on Monday, July 15, Treasury was supposed to open its FATCA Portal that foreign institutions could begin to register with the IRS. However, the IRS released Notice 2013-43 in conjunction with Treasury’s announcement that its FATCA portal would not be available before August 19, 2013. Thus, the IRS has had to push back the other key dates for registration by an additional 6 months as well. After the FATCA registration website opens, a financial institution will be able to begin the process of registering by creating an account and inputting the required information for itself, for its branch operations, and, if it serves as a “lead” financial institution, for other members of its expanded affiliated group. The IRS will not issue any GIINs in 2013. Instead it expects to begin issuing GIINs as registrations are finalized in 2014. The IRS will electronically post the first IRS FFI List by June 2, 2014, and will update the list on a monthly basis thereafter. To ensure inclusion in the June 2014 IRS FFI List, FFIs would need to finalize their registration by the new deadline of April 25, 2014 instead of the original October 25, 2013 deadline. FATCA withholding agents generally will be required to implement new account opening procedures by July 1, 2014 instead of January 1. For Participating Foreign Financial Institutions (“PFFI”), new account opening procedures are correspondingly extended to at least July 1, 2014, but even further to the effective date of its FFI agreement if it registers timely via the FATCA Portal. With respect to a registered deemed-compliant FFI: any account, instrument, or contract maintained, executed or issued by the FFI prior to the later of July 1, 2014, or the date on which the FFI registers as a deemed-compliant FFI and receives a GIIN. Treasury intends to include a similar change to the definition of the term “Preexisting Account” in both model IGAs. Thus, it is expected that future IGAs will define the term “Preexisting Account” to mean a Financial Account maintained as of June 30, 2014. For IGAs in force that contain the previous definition of the term “Preexisting Account,” the partner jurisdiction will be permitted under the coordination provision of the IGA to permit its FFIs to substitute the definition of the term “preexisting account” from the amended final regulations for the definition of the term “Preexisting Account” in the IGA. For IGAs concluded before the coordination provision was added, the coordination provision will apply through the operation of the most-favored nation provision once an IGA containing the coordination provision is in force. The final regulations provide that a PFFI will be required to file information reports on its U.S. accounts with respect to the 2013 and 2014 calendar years no later than March 31, 2015. Treasury and the IRS intend to modify these rules to require reporting on March 31, 2015, only with respect to the 2014 calendar year (for U.S. accounts identified by December 31, 2014). For a 400 page analysis of how to cost effectively comply with FATCA, please see “LexisNexis® Guide to FATCA Compliance” containing 25 chapters for meaningful interactions among enterprise stakeholders, and between the FATCA Compliance Officer and the FATCA advisors and vendors, as well as analysis of the compliance requirements of the current IGAs signed by Treasury. Editor’s Note: The following is an excerpt from Chapter 2 of LexisNexis® Guide to FATCA Compliance by William Byrnes and Robert Munro. coordinate withholding as appropriate and if necessary. The requirements are largely intertwined, with due diligence serving as the foundation for the reporting and withholding requirements. Now that the final FATCA Regulations are published and a number of intergovernmental agreements (“IGAs”) have been signed, FFIs must implement practical steps to be FATCA compliant by January 1, 2014. There is no one-size-fits-all compliance plan for FFIs; however, there are many similar and consistent steps FFIs, regardless of location, can take to develop a FATCA compliance program to meet the broad goal of FATCA: to combat offshore tax evasion by U.S. persons and become FATCA compliant. Before a FFI can become FATCA compliant, a FFI should take certain preliminary steps to determine the impact FATCA will have on the FFI as well as plan the path toward compliance in an efficient and timely manner. Early in the process, the FFI should develop a FATCA task force or program team that will oversee the day-to-day operations to becoming FATCA compliant. The task force should include representatives from tax, anti-money laundering (“AML”) and customer on-boarding groups, technology, change management and operations as well as, potentially, other stakeholders. The task force will oversee the broad program plan for the FFI and likely report to the FATCA sponsoring executives or steering committee. The FFI may also want to prepare a list of questions, a “FAQs of FATCA,” to ensure the FFI’s clients are receiving a consistent message, regardless of where in the world they are located. FFIs should also determine what if any message they want to provide directly to clients or put on their websites, although it is very important that the FFI does not give unintentional tax advice to its clients. Additionally, some training of FFI staff, including client-facing personnel, could assist with customers of the FFI receiving a clear and consistent message. It may likely be the FFI’s client-facing personnel are already receiving questions from customers regarding FATCA. Identification of information technology (“IT”) systems and databases that maintain relevant information and may require updates. The FFI should also determine what past interactions it has had with the IRS or home country tax authority relating to information reporting on their customers. FFIs may be able to leverage past reporting for FATCA compliance. FFIs around the globe may rely on other parties to take on certain responsibilities. For example, a foreign fund may outsource some or all of its asset custody, compliance and regulatory functions, transfer agency services and/or distribution. In this case, the FATCA compliance program will only be as strong as the weakest link. Coordinating and ensuring all relevant parties are working towards FATCA compliance will be important since a FATCA compliance failure on behalf of an agent of the FFI can be construed as a failure by the FFI itself. Asking questions of the FFI’s third-party service providers will be an important early step. If a third-party service provider is not working towards FATCA compliance, the FFI may want to re-assess their relationship and engagement with that party. Jeffrey Locke, Esq. is Director at Navigant Consulting. Prior to joining Navigant, he served as an assistant New York state attorney general in the Criminal Prosecutions Bureau and worked in the prosecutor’s office for the United Nations in Kosovo. Partners in a partnership and members of an LLC, taxed as a partnership, cannot have individual SEP IRAs (Simplified Employee Pension Individual Retirement Account) plans, according to the IRS. Only employers are capable of implementing SEP plans for their employees. Because partners are employees of the partnership for retirement plan purposes, they cannot have an individual SEP plan. If partners in a partnership wish to use a SEP plan, the partnership as an entity must maintain and contribute to the plan for the partners. For previous coverage of IRAs in Advisor’s Journal, see Qualified Charitable Distributions from an IRA (CC 11-03) & How Are IRA Owners Investing Their Money? (CC 11-112). For in-depth analysis of SEPs, see Advisor’s Main Library: IRAs and SEPs. Long-term gains yield more favorable tax costs than short-term gains. Short-term gains carry an additional 20% tax cost over long-term gains, encouraging the manufacturing of transactions designed to convert short-term to long-term gains. Unfortunately, these transactions attract undue attention from the IRS and are often disregarded by the Service. The IRS recently considered the tax treatment of one of these gain-recharacterization schemes, a basket option contract, in a generic legal advice memorandum (AM 2010-005). The IRS altered its categorization of the contract, viewing it as if the investor purchased the securities in a margin account, paying cash equal to 10% of the value of the securities and borrowing 90% of the value from the investment bank. Just as was the case with the “option,” the investor had almost total control over investment of the securities and would reap all appreciation and income from the securities, less interest and brokerage fees. For in-depth analysis of options, see Advisor’s Main Library: G—Options and Futures. A massive increase of lawsuits and IRS investigations have surrounded the Millennium Multiple Employer Welfare Benefit Plan for years, with plan participants claiming it was nothing but a fraudulent device with sole purpose of generating millions in commissions for its agent promoters. There are accusations of taking a total of $500 million from 500 clients by inducing them to participate in a plan that offered no tax or other benefits to its participants. Several lawsuits are still pending against the Millennium Plan, but at least one aspect of the alleged scam plan has been resolved. The IRS announced on July 5 that it reached an agreement with the Millennium Multiple Employer Welfare Benefit Plan (“Millennium Plan”). After numerous fraud allegations and the IRS abusive tax shelter investigation, the Millennium Plan filed for Chapter 11 bankruptcy. For previous coverage of welfare benefits plans in Advisor’s Journal, see Tax Courts Holds Employee Taxable for Value of Life Insurance Owned by Welfare-Benefit & Deductions for Life Insurance Premium Payments to Welfare Benefit Plan Denied (CC 10-29). Are you an employee or independent contractor of your firm? If you’re doing business in California and get the classification wrong, you could be in for criminal charges and up to a $25,000 fine. California State Bill 459—which would impose strict recordkeeping requirements and severe penalties on firms that misclassify employees as independent contractors—passed the state senate on June 2. The bill moved to the Assembly and went on to a hearing at the Assembly Committee on Labor and Employment two weeks later. The bill is expected to come to a vote in the Assembly later this summer. Under the bill, firms that mischaracterize employees as independent contractors can be subject to fines of up to $25,000. They also will be required to keep records verifying independent contractor status for at least two years or face a fine of $500 per employee and misdemeanor criminal charges. For in-depth analysis of income taxation, see Advisor’s Main Library: Income Taxes. Failure to file an FBAR (Report of Foreign Bank and Financial Accounts) can result in harsh consequences. The report is that fines of up to $500,000 and 10 years imprisonment can be rendered. Therefore, the need to for you and your clients with foreign financial accounts (FFAs) to familiarize yourselves with the Treasury’s escalating FBAR rules. Unfortunately, understanding the FBAR rules has not always been a straightforward proposition. Until recently, the FBAR requirements were shrouded in mystery; but with the release of the last FBAR regulations earlier this year, the rules are finally clear. Furthermore, important clarifications were made by the IRS at a June 1 webcast. Read this complete analysis of the impact at AdvisorFX (sign up for a free trial subscription with full access to all of the planning libraries and client presentations if you are not already a subscriber). For previous coverage of the FBAR in Advisor’s Journal, see Do Your Clients’ International Assets Create Criminal Tax Exposure? (CC 11-73). As an advisor, your clients look to you for competent advice in planning their charitable giving. It would be terrible to find out that the gift you thoughtful suggest cannot be deducted due to an avoidable paperwork mistake. Although the IRS sometimes forgives these minor errors, others are unforgivable, as illustrated in recent IRS email advice. The IRS was not so forgiving with a taxpayer, who made what would otherwise qualify as a tax-deductible charitable gift. The problem was that the taxpayer “failed to get a contemporaneous written acknowledgment” from the charitable organization. In its advice the IRS said it will deny the taxpayer’s charitable deduction even if the taxpayer takes remedial measures and the charity amends its Form 990 (Return of Organization Exempt from Income Tax) to acknowledge the donation and include the information required by the Code. For previous coverage of charitable deductions in Advisor’s Journal, see Qualified Charitable Distributions from an IRA (CC 11-03) & IRS Takes Qualified IRA Charitable Distributions off the Table for 2010 (CC 11-15). For in-depth analysis of the charitable deduction under Section 170, see Advisor’s Main Library: B6—The Income Tax Charitable Deduction—I.R.C. §170. The Tax Court recently determined that the fair market value (FMV) of a life insurance policy distributed by a terminated 419 welfare benefit plan is reduced by surrender charges. [Lowe v. C.I.R., T.C. Memo. 2011-106 (2011)]. This ruling strengthens the Tax Court’s position on surrender charges that was enunciated in Schwab v. Commissioner [Michael P. Schwab et ux. v. C.I.R., 136 T.C. No. 6 (2011)]. The IRS continues to challenge taxpayers who apply surrender charges to reduce or eliminate their tax liability when a policy is distributed to them by a welfare benefit plan. However, this ruling adds another degree of certainty to the FMV calculation. For previous coverage of Tax Court rulings in Advisor’s Journal, see Tax Court Revives Partnership Self-Employment Tax Debate (CC 11-56). It’s a given that most of us want to extend our lives as long as possible. But our ever-increasing life spans can financially strain pension funds and others that are contingent upon us dying to keep their books balanced. Pension funds face severe longevity risk. If pensioners live longer than expected, payouts from the funds could eclipse the estimated cost of keeping the funds stable. Worldwide, $17 trillion of pension funds – $23 trillion in assets – is exposed to longevity risk. But the big banks—including Goldman Sachs, JPMorgan Chase, and Deustsche Bank—are coming to the rescue by packaging that longevity risk and selling it to investors; and they’re counting on investors being interested in gambling on death. For previous coverage of life insurance contracts in Advisor’s Journal, see IRS Guidance Provides Safe Harbor for Policies Maturing After Age 100 (CC 10-51). For in-depth analysis of pension plans and other qualified employee plans, see Advisor’s Main Library: O – ERISA – FAQs. Clients often want to use Qualified Terminal Interest Property trusts (QTIPs) to separate certain funds to care for a surviving spouse, while retaining some measure of control over the general distribution of the funds—whether they will be distributed to children or a charity. But navigating the QTIP rules as client’s circumstances naturally endure change can be cumbersome. The danger exists when errors that seem trivial, result in eliminating any transfer tax benefit of the trust. A recent IRS private letter ruling (PLR 201117005) provides us with a good reminder of the QTIP rules and an example of creative QTIP planning that provides the surviving spouse with adequate lifetime income while giving the grantor (and the surviving spouse) a degree of post-death control over disposition of the trust assets. For a graphic illustration of the QTIP trust, see the Concepts Illustrated practice aid at G—Credit Shelter Trust and QTIP Trust. For coverage of QTIPs and other techniques useful in estate planning for blended families, see the Advisor’s Journal article Estate Planning for Blended Families (CC 07-16). For in-depth analysis of marital deduction planning, see Advisor’s Main Library: G—The Marital Deduction. The collapse of the secondary market for life insurance during the recent financial crisis left a lot of trusts anxious to dispose of large face value life insurance policies. Trusts that handed back policies in satisfaction of premium finance loans were then struck, along with their grantors, with massive tax bills for what is known as cancellation of indebtedness or cancellation of debt (COD) income. The IRS recently released proposed regulations that address the income tax treatment of cancellation of debt income of trusts. Although this highly technical area of the law may not be of interest to lay audiences, it is a vital aspect for advisors selling high-value life insurance policies. For previous coverage of an interesting case involving a premium financed policy in Advisor’s Journal, see Lawsuit Seeks to Hold Insurer Responsible for Suspicious Death (CC 10-101). For in-depth analysis of life settlements (which can be structured as a premium finance transaction), see Advisor’s Main Library: B—The Life Settlement Industry. IRS High Net Worth Initiative: Fearsome Beast or Paper Tiger? The IRS commenced the Large Business and International Division’s high-wealth industry group (“HNW Initiative”) in October 2009 with the aim of examining high-net worth individuals for income tax compliance. But the Service may be “using more rhetoric than resources,” according to Syracuse University’s Transactional Records Access Clearinghouse (TRAC). TRAC’s April 14 report, based on information compiled from public records, accuses the IRS of having “very skimpy” audit goals for the HNW initiative. TRAC’s orginal goal was to audit a mere 122 returns for the 2011 fiscal year. However, according to reports, TRAC will fall far short of this modest benchmark, and instead only audit 19% of the projected returns for the first six months of the year.